Text: mina and uniquely reconstructed them to come up with ‘amabro’. ‘amabro’ is a product line focused on showcasing gifts made in Japan, and to make ‘art’ a part of everyday life, enriching it. amabro designs a product line for babies called the ‘BAB Series’, which includes T-shirts and bibs for babies designed with illustrations smacking of the tiniest arrogance, kitschy, cute toy shoes, and the ‘STORY RING’ line of fashion accessories. In addition, they sell gifts with special packaging, highly recommended to anyone. Aside from that, amabro’s ceramics series acts as a nod to Japanese traditional artisans and their craft, with designs that build a bridge across time, joining the past to the future. Blending both the traditional with the modern, the designs seem to remind us of how far we’ve come in transcending space and time to build new lives for ourselves. Interestingly, Europe may have had a long culture of lavishly decorating its pottery and ceramics compared to Japan, but what happens when the Japanese attempt to make ‘art’ an enriching part of everyday life? amabro’s answer comes in the form of ‘soil’, plate art that features silkscreen or photomontage images. The ‘KOTTO’ line is a series that redesigns unsold Arita porcelain ware once tucked away and forgotten. Each decorative plate, more different than the next, bears novel designs by Amane Murakami. But not every plate will survive the process of rebirth intact, whereby they are put into the kiln once again after half a century has already passed. For those that remain unbroken, it’s almost like a miracle, and each plate seems all the more precious because they have had new life breathed into it, by successfully passing through the fires of the kiln. In 2010, the new product line ‘CHOKU’ (photo) was launched, featuring designs incorporating arabesque or iron-glazed patterns, as well as dragons and ink octopuses. Designed in the ‘Soba Choko’ style, this series, featuring common, easy-to-use tableware, was made with the purpose of breaking away from the traditions referenced to in ‘soil’ by showcasing authentically Japanese products instead. 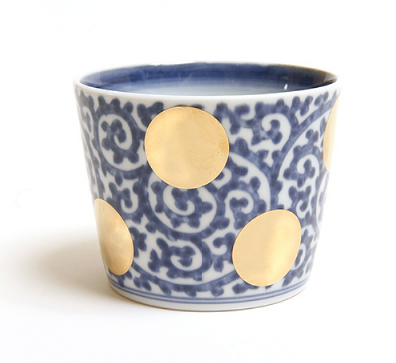 The indigo blue patterns used are inspired by decorative patterns used on soba choko (small cups used to contain sauce to dip soba noodles in) in 17th-century Arita, created by craftsmen with the technique of underglaze decoration, and emulated by Amane Murakami using overglaze decoration. amabro’s products can be found online and in select stores nationwide, such as ‘Pass the Baton‘ and CIBONE‘. amabro’s products are worth looking at, for those searching for truly novel gifts.